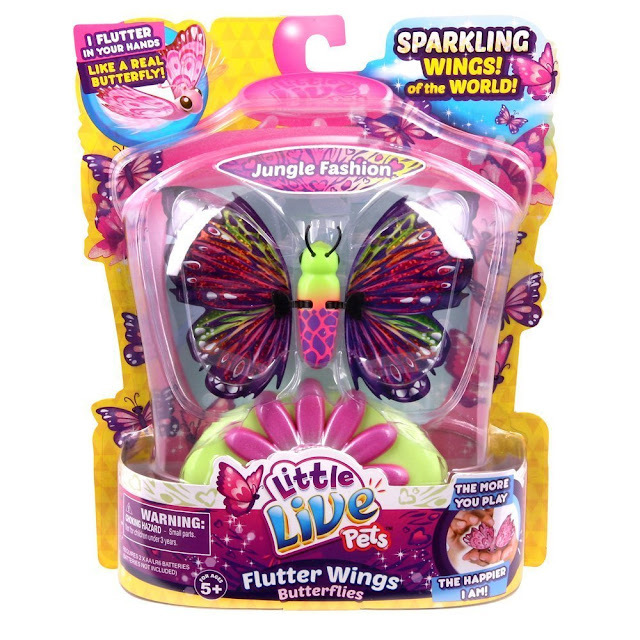 Win a Little Live Pets, Flutter Wings Butterflies - Jungle Fashion from Character Options worth £15.99! Beautiful Little Live Pets Butterfly is your new pet friend that magically comes alive and flutters in the palm of your hand! See how your new friend feels and flutters its stunning wings just for you. Your Little Live Pet Butterfly feeds and gets energy from the included flower base, the more you feed your pet the happier she becomes. With her wings dancing magically in the palm of your hand, this is the lifelike pet that every child wants! Take your pet friend with you wherever you go! Series 2 includes all new Sparkling wings of the world characters to collect! Your butterfly friend now has beautiful sparkling, glittering wings. Six unique and individual butterflies to collect including Frozen Iceland, Tropical Beauty, Precious Paris, Cherry Blossom and Jungle Frozen. Please note: You must at least follow/like both Unique Young Mum and Character Options on at least one social media platform! To find out more about Character and to view their full collection, check out the official website here.